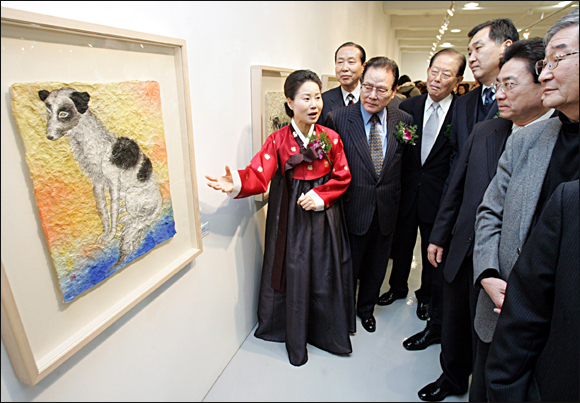 Folk painter and Dongguk University professor Suh Gong - im explains the meaning behind her folk paintings to visitors during the opening of her “Kilsanghwa” exhibition at Hankook Ilbo Gallery in central Seoul, Tuesday. In celebration of the Year of the Dog, the exhibition showcases some 40 pieces of kilsanghwa, which are traditional paintings designed to drive away bad luck and bring in fortune. The folk paintings feature auspicious an im als like tigers, dragons, chickens or dogs.